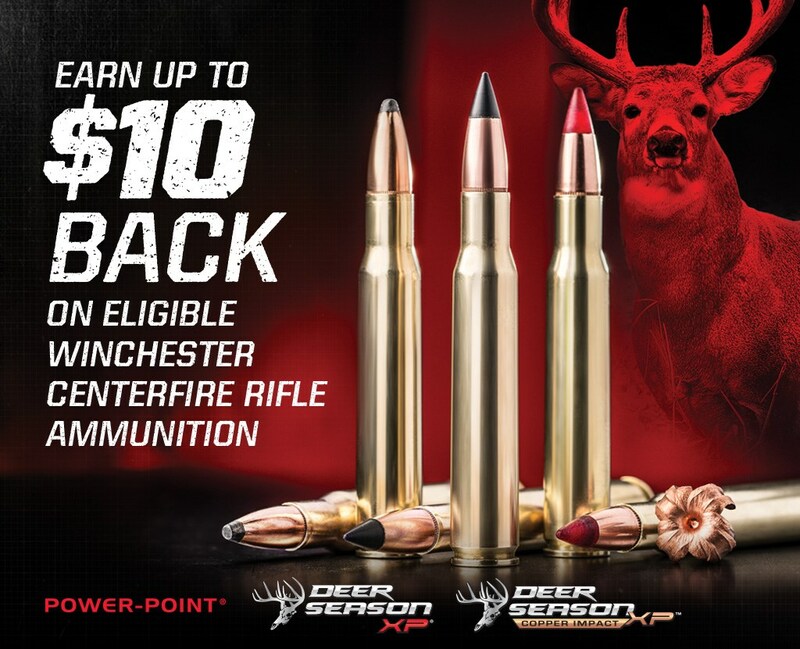 Between August 1, 2018 and December 2, 2018, earn up to $10.00 back on eligible Winchester Centerfire Rifle Ammunition. Earn $5.00 for each box of Power-Point, Deer Season XP or Deer Season XP Copper Impact, Centerfire Rifle Ammunition Purchased. Limit one offer per household. Offer is valid on qualifying purchases made between August 1, 2018 and December 2, 2018. Earn $5.00 for each box of Power-Point, Deer Season XP or Deer Season XP Copper Impact, Centerfire Rifle Ammunition Purchased. Offer expires and all requests must be received by December 15, 2018. Rebate is in the form of a Winchester Ammunition check. Minimum rebate amount $5 (one box). Maximum Rebate amount $10 (two boxes).